^So what, exactly, does it mean to be a mom? ^No matter what phase of motherhood a woman finds herself in, she has one thing in common with all other moms: the need to feel appreciated and encouraged. Harry H. Harrison Jr.'s latest dose of trademark wit and wisdom?pays tribute to the many aspects required to be a mom. Ranging from new moms, working moms, single moms, moms of adult kids and more, 1001 Things it Means to be a Mom provides a big dose of praise and understanding that will leave moms from all walks of life feeling uplifted and highly valued. With two million books in the market, no one knows how to deliver such simple, powerful insights like Harry. 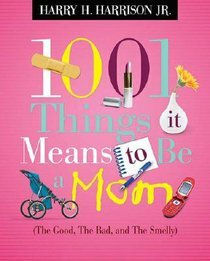 About "1001 Things It Means to Be a Mom"
Harry Harrison is an award-winning copywriter and principal of the creative consultancy firm, Harrison Creative Direction. His is also the author of "Father to Son" and "Father to Daughter".